I would like to introduce you to the brand-new Item Collections system! Item Collections is a new set of achievements with new, unique rewards that are tied very specifically to the finding of items and skins. In the new Collections section of the Achievements panel, you will find a handful of new achievements. It may not look like many to start, but there are a large number of hidden collections that will open up as you explore the world. Every Item Collections achievement has reward items in addition to achievement points. These rewards can be just about anything! There are a number of new pieces of equipment, recipes, and functional unlocks that can only be found as rewards for Item Collections, like the new Spirit Crafter back item, earned by completing its namesake achievement. There are three ways to obtain collections: automatic, discovered, and unlocked. Automatic collections are immediately available and visible to you when you look at your Achievements panel. These are the base set of collections, and they serve as something of an introductory course to the system. Beyond this initial set, there are a number of discoverable collections. These will automatically become visible the moment you collect something that is part of that collection. For example, if you’re an avid dungeon runner, you will probably discover several hidden collections right away. Finally, there are collections that have to be unlocked by using an item before they can be seen or progressed. Go visit Rednax Youngblood in Lion’s Arch and he may provide you with the coveted Collectible Spoon Box to start your Koutalophile collection. This achievement is completed when you’ve found all of Tyria’s spoon trinkets. Most are sold by renown vendors to commemorate specific locations, but a few new spoons have found their way into some very dangerous locations. 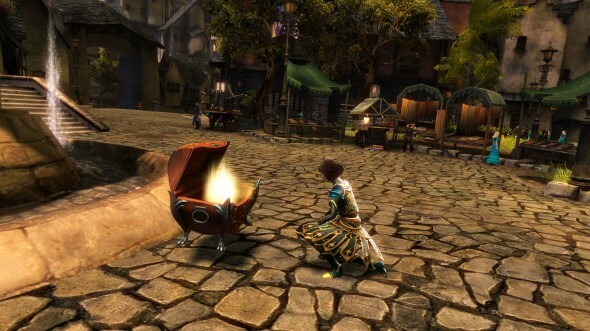 Other unlock items can be found on creatures and in chests throughout Tyria. There are three ways an item can be collected. An item can be bound to you (either to your character or account), used by you, or unlocked as a skin in your wardrobe. Usable items are considered collected once they are used. For example, opening a loot bag or eating food. Bound items are collected the moment they are bound. So, if you loot a ring that is bound on acquisition, congratulations, you’ve contributed to your collection! If you loot a collectible trinket that is tradable, you now have a decision to make—will you bind it to your collection, or sell it on the Trading Post to another industrious collector? Collectible skins are counted toward achievements as soon as they become unlocked in your wardrobe. A collection may be just one type or could include all three types of items. You may be wondering, “What if I’ve already been collecting things, because that’s just the type of person I am?” Good news! We are doing our best to give you the progress you deserve in Item Collections achievements. Any skin you have unlocked will automatically contribute toward appropriate collections. Any bound items you still possess will also contribute as soon as you log in with the character holding that item. However, items that you use will have to be used again, so that one steak you ate a year ago won’t count. Also, any item you owned but got rid of will have to be obtained again. For many of you, this will mean that the first time you log in after the September 2014 Feature Pack goes live, you will get a lot of notifications for new collections you’re unlocking, progress you’re making in those collections, and if you’re lucky, maybe even a few rewards! With miniatures moving to the Wardrobe, the old Collections panel in the account bank was no longer a very accurate name for what was found there. It is now, more accurately, called Material Storage. All text that would call out items in there has been updated. 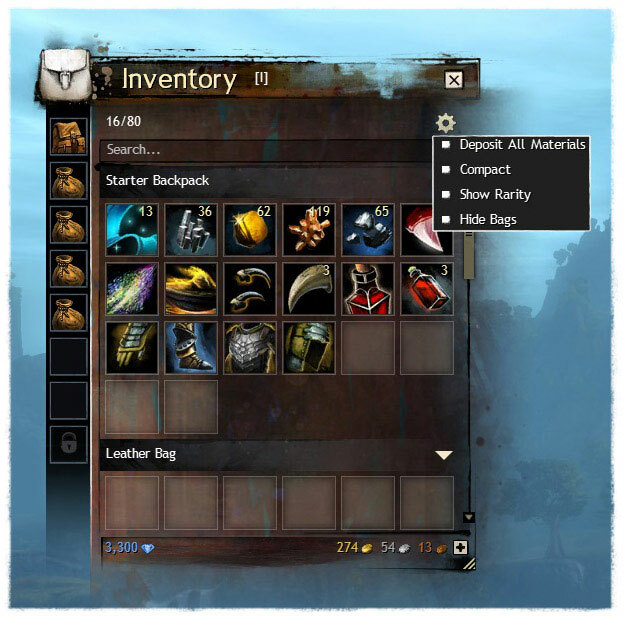 For example, the “Deposit All Collectibles” option in your inventory will now read “Deposit All Materials.” Henceforth, any use of the terms Collections and Collectibles will refer to Item Collections. Apologies for any confusion caused during this transition. 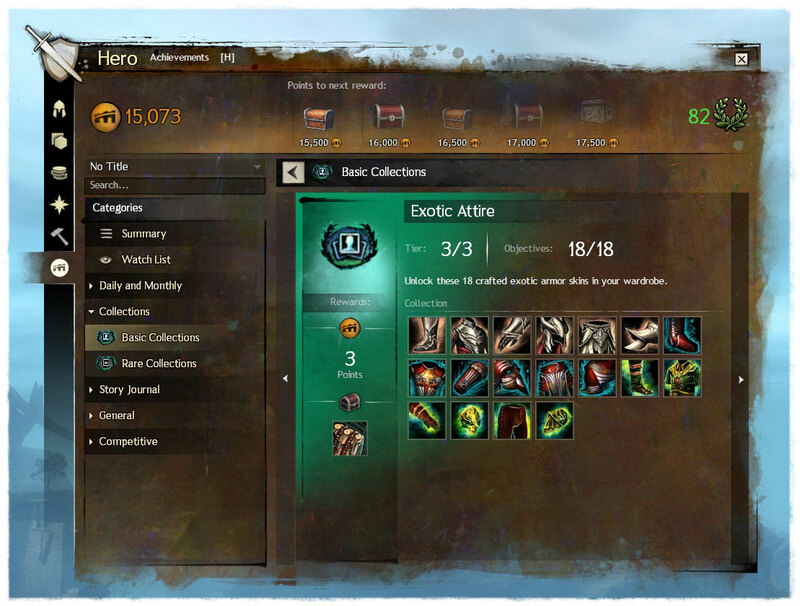 In an effort to make achievements easier to navigate, Item Collections will come paired with some slight reorganizing in the Achievements Panel. All of the existing achievements are still there, they’ve just been moved around into groupings that make the initial experience a little easier while keeping individual achievements easy to find. All of the WvW, PvP, and Activity achievements are now located in the new Competitive achievement category. All of the Region, Boss, and Dungeon achievements are now found in the General achievements category. Finally, the new UI created for Item Collections achievements is now used for all achievements. We felt that the UI was much cleaner, more straightforward, and would be a welcome change to all achievements. This is certainly not the last you will be seeing of Item Collections. We have many more in the works, some that stand alone and some that are deeply tied to the Living World. We are very excited for this new system and what it will bring to the game going forward. We had a lot of fun designing and building it, and we hope you have as much fun playing it. So get out there, explore the world, and find that last piece of loot!